Unifaun Theatre has engaged Nathan Brimmer and Joe Zammit along with renowned Shakespearean scholar James Ryder to interpret what is purported to be Shakespeare’s long-lost first play. The script, found in a parking lot in Leicester, England, was written by the playwright at the age of 17. 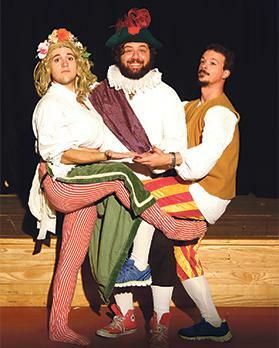 The abridged version of the play, by Reed Martin and Austin Tichenor, weaves together most of the famous speeches and plot devices of Shakespeare’s 39 plays to create a fast, funny and fictional 40th one, filled with witty wordplay and vaudevillian variety. In the plot, an ancient grudge pits Puck (from Midsummer Night’s Dream) against Ariel (from The Tempest) and turns Shakespeare’s canon upside-down, creating such strange bedfellows as Hamlet and Lady Macbeth, Viola and Richard III, King Lear and the Weird Sisters, and Dromio and Juliet. The play is directed by Chris Gatt. William Shakespeare’s Long Lost First Play is showing on Saturday and Sunday and on October 12, 13, 14, 15, 19, 20, 21 and 22 at St James Cavalier, Valletta. For more information and tickets, visit www.kreattivita.org or call 2122 3216.